After a bumpy last couple years, e-commerce took off again, buoyed by rising consumer confidence and the fast emergence of deal sites like Groupon and Living Social. That was one of the many take aways from ComScore’s U.S. Digital Year in Review, which looked at the changing face of digital media as it expanded through social, mobile and video. The report is not a surprise if you’ve been following along but the overall picture shows how the digital media landscape is evolving quickly in a number of ways, fed by advances in broadband and increased dependence on the web. After two rocky years, e-commerce spending reached $227.6 billion in 2010, up 9 percent over the previous year with holiday growth hitting 12 percent, even better than ComScore originally forecast. Cyber Monday finally took home the title of biggest online spending day with $1.028 billion on Nov. 28, the first time that Cyber monday sales eclipsed $1 billion. The big news in e-commerce was the emergence of local group buying sites. Groupon nabbed 10.7 million unique visitors in December, up 712 percent compared to the same period in 2009 while LivingSocial grew by 438 percent to 5.7 million unique visitors. spent online in the U.S., compared to 7.2 percent a year ago. Fueled by Facebook’s dominance, social networking became the second most popular entry point for online users, leap frogging e-mail and entertainment though falling short of more traditional portals. By the end of last year, 9 out of every 10 online users visited social networking sites. Facebook, which grew by 38 percent to 153.9 million users in December and now accounts for 10 percent of page views in the U.S., wasn’t the only social networking site to grow. Third-place LinkedIn grew by 30 percent to 26.6 million users while Twitter.com grew by 18 percent in 2010 to 23.6 million visitors in December. Tumblr exploded with 168 percent growth to 6.7 million users. Meanwhile, second place MySpace declined by 26 percent to 50 million users. While Twitter continued to grow, its share of 2-17-year-olds dropped by 8 percent in December compared to the year before though it grew by 9.4 percent among 18-34-year-olds. Online display ads grew by 23 percent from December 2009 to 2010, fueled in large part by increased advertising on social networking sites. Social Networking sites, led by Facebook with 1 trillion ads in 2010, represented 34 percent of the display ads served in December 2010, up 11 percent over the year before. Meanwhile the online video viewing grew in a number of ways, reflecting the migration of traditional TV viewers to online sources. In December of 2010, 88.6 million people watched online video on an average day in, up 32 percent from December 2009. The average American spent more than 14 hours watching online video in December, up 12 percent over the previous year and streamed a record 201 videos, an 8 percent increase. Finally, the mobile market showed no signs of let-up in 2010. Smartphone penetration hit 27 percent by the end of last year, fueled in large by the surging Android platform, which charged into second place behind RIM (31.6 percent) with 28.7 percent, ahead of Apple’s iOS at 25 percent. It’s pretty clear to everyone in the industry that online video usage is taking off – what isn’t clear to me is whether anyone, FB included, has figured out a revenue model that compensates for the cost of storage and bandwidth – which is likely to rise in the short to medium term. 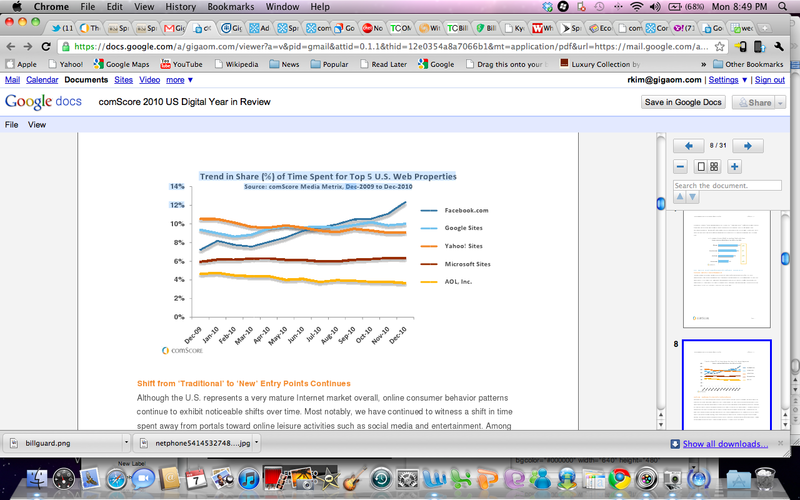 interesting how Facebook just started pulling away from the other sites… they look unstoppable.